Alan is bullied by his older brother, Nathan. Nathan always has some new way to make it clear he is in charge between the two brothers and he has just suggested they play one of his favorite games, Cole vs. Cole. Both brothers think up things for the other brother to accomplish and whomever gets his list done is the winner. The problem is that Nathan's tasks for Alan are always humiliating but if Alan doesn't do them, the consequences are worse. In Nathan's new proposal he sets seven nearly impossible tasks for Alan to do with the last one being "stand up to Dad". As bad as Nathan is, their father is even more controlling. If Alan doesn't complete the list, Nathan promises to tell everyone a secret Alan has been keeping from everyone - he's gay. In a stroke of genius, Alan challenges Nathan to complete the exact same list and the race between the two brothers is on. I've seen a few reviews describing this title as hilarious and poignant. I am totally on board with the poignant part of that but not the hilarious one. There are some funny lines but the humor is masking the tension of the bullying from both brother and father and the dread of Alan being outed. I wasn't expecting a laugh riot so I really liked this book and how Alan came to find his voice. Faced with coming out - a revelation he thinks will turn everyone against him - Alan digs down to strengths he didn't know he had. Even better, he decides to rely on his friends who he has kept at arm's length. Bell handles the actual coming out so well without resorting to a fairy tale ending (although I feel like the ending with Dad was a little bit of a softball). 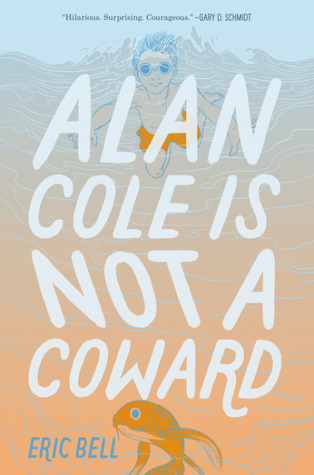 But other than that (very slight, minor) flaw, this is a wonderful story of family dynamics with a gay character who is younger than we usually find in teen fiction, someone just beginning his journey.